Home » 2012 Minutes » MARFC at Auto City Speedway! MARFC at Auto City Speedway! 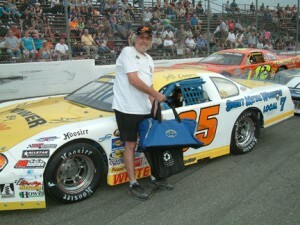 July 21st took us to the Auto City Speedway where the MARFC Helmet Bag was given to 2011 ACSS Champion Jeff Owens. Jeff has been a long time competitor at the speedway as well as a fantastic supporter of the division. Megan Bolt was our member raffle winner and Board Member Chuck Horan and club member Bob Ryder were our table helpers for the night. This was our re-scheduled night as the original night in May was rained out. MARFC Members were treated to the Tommy Bowles Memorial for the MCR Dwarf Cars. Many will remember “Ten Grand Tommy” Bowles as one of the leading Late Model pilots in the state. Tommy lost his life while in Florida driving a dwarf Car and this group puts on this special race at Tommy’s home track every year. Many thanks to Joe DeWitte, Sharon Fischer, and the staff at Auto City, especially Larry Loynes for all the mentions of the club. Steve Martin, promoter of the MCR Dwarfs also donated some Rislone bags and products to the fans and to our MARFC Helmet Bag winner, Thank You Steve. Previous post Mt. Pleasent MARFC Night Cancelled! Next post Merritt Raceway Welcomes MARFC!